Wagon Tales, under jockey Cody Jensen, sets the top qualifying time for the 2013 G1 All American Futurity on Friday at Ruidoso Downs. RUIDOSO DOWNS, NM�AUGUST 16, 2013�JHB Enterprises� Wagon Tales turned in a sensational :21.021 time for 440 yards in the fourth of 14 trials on Friday and led the second- and third-place runners from that trial into the Grade 1, $2.6 million All American Futurity. The horses with the five-fastest times from Friday�s trials join the horses with the five-fastest times from Thursday�s 14 trials on Labor Day in the All American Futurity, which has the largest purse of any two-year-old race in North America. Wagon Tales� time was also the quickest mark from the two days of trials, surpassing the top time on Thursday set by Hes Relentless, :21.148. The Cody Jensen-ridden Wagon Tales won the trial by one length over Skuze Pleeze while it was another one-and-one-half lengths back to third-place finisher Fatal Policy. Skuze Pleeze posted the second-fastest time of :21.177 while Fatal Policy sports the fifth-fastest time of :21.412. �He broke really well from the gate,� said Jensen. �He�s a big, rangy quarter-mile type of horse. Wagon Tales was the even-money choice after finishing a close third behind Big Biz Perry and Hes Relentless in the Grade 1, $1 million Heritage Place Futurity back on June 1. Big Biz Perry won his All American Futurity trial on Thursday, however his time was not quick enough to qualify for the futurity. Hes Relentless topped the Thursday qualifiers. All three of those horses did not make a start between the Heritage Place Futurity and the All American Futurity trials. Wagon Full Of Gold, under jockey Jay Conklin, qualifying to the All American Futurity(G1). The Judd Kearl-trained PYC PAINT YOUR WAGON colt was dangerous in his three races leading up to the Heritage Place Futurity. After a second in his Remington Park Futurity trial, he won the Remington Park Juvenile by one-half length and then his Heritage Place Futurity trial by three quarters of a length with the fastest time on the second day of trials. Owned by Ezra Elton Lee, Jill Giles and Melvin Neugebauer, Wagon Full Of Gold has been progressing in each start for trainer Wes Giles. 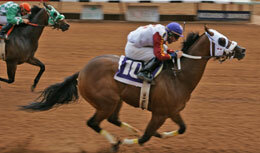 The gelding capped his improvement with a two-and-three-quarter-length win in the second All American Futurity trial. His time of :21.331 was the third-fastest time on Friday afternoon. The PYC PAINT YOUR WAGON-sired gelding was fifth in his only start at Sunland Park for trainer Wes Giles and then won his Ruidoso Futurity trial by one-and-three-quarter lengths, his previous start before the All American Futurity trials. For the complete list of All American Futurity (G1) qualifiers, including times, sires, dams, owners, breeders, trainers and jockeys CLICK HERE. For a list of preferred invites to the 2013 All American Juvenile Invitional CLICK HERE. 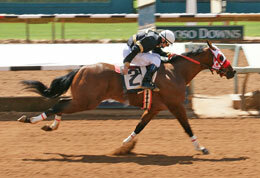 All trial races videos and additional information on the 2013 All American Futurity can be found on www.allamerican-ruidoso.com.